The conversation around entrepreneurship is expanding more and more to create space at the table for young business people. Youth entrepreneurship programs and training have been created for children in high school, middle school and now even in elementary school. In this episode we meet a couple of young entrepreneurs who are gaining invaluable lessons and experience from THE organization that has been training and grooming young women for over 100 years. Joining us is Bonnie Barczykowski. 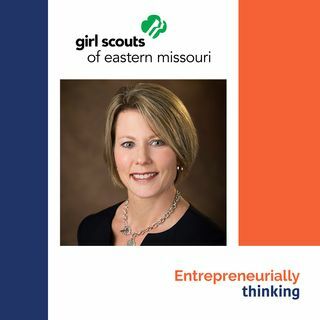 ... See More She is the Chief Executive Officer of the Girl Scouts of Eastern Missouri. With Bonnie is 9-year-old Girl Scout Brownie, Aria Pelikan and 13-year-old Girl Scout Cadette, Taylor Boaz. Both are extraordinary examples of the legacy of leadership, adventure, and success. - How the Girl Scouts offer every girl a chance to practice a lifetime of leadership, adventure, and success. - How entrepreneurship is integrated in programs. - How the CEO of Girl Scouts of Eastern Missouri approaches the effort to give every girl an opportunity to become a leader. - What are the considerations of the CEO and how does she think out-of-the-box to keep this 100-plus year organization thriving. - Cadette and Brownie advice for other little girls. - What can Girl Scouts teach about business.